Construction and manufacturing are two key sources of demand for the plastics industry. As the most recent data suggest a positive outlook for these sectors, they suggest a similarly positive outlook for demand in plastics. Last year closed with monthly construction spending up 0.7 percent in December, according to the latest report from the U.S. Census Bureau. On an annual basis, construction spending in the U.S. increased 3.8 percent, with residential construction up 4.7 percent. Meanwhile the value of manufactured goods shipments in December rose 0.6 percent. Shipments of industrial machinery slipped 1.9 percent, and plastics and rubber products increased 0.9 percent. 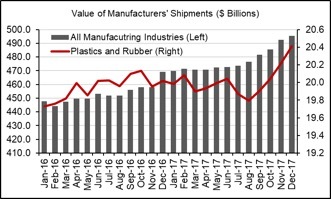 On an annual basis the value of manufactured goods shipments in 2017 was 5.2 percent above 2016, with industrial machinery shipments up 3.8 percent and plastics and rubber products shipments virtually unchanged, edging down just 0.1 percent. New orders of manufactured goods increased 1.7 percent in December—a 6.0-percent increase on an annual basis. New orders for industrial machinery were up 4.3 percent in December, marking an 8.6-percent rise from 2016. Unlike the estimates for the value of manufactured goods shipments, the U.S. Census Bureau estimates new orders of nondurable manufactured goods on an aggregate, meaning a breakdown of estimates for nondurable goods like food products, apparel, paper products, plastics and rubber products, and other. As such, the Census figures for new orders of nondurable manufactured goods increased 0.7 percent in December—a 6.2 percent increase in 2017 from the previous year. In addition to the positive impact these figures have on optimism in the plastics industry, the effects of the growth momentum in construction and manufacturing sectors of the U.S. economy at the close of 2017 were also reflected in the January jobs report from the Bureau of Labor Statistics (BLS). The unemployment rate held steady in January at 4.1 percent with the addition of 200,000 nonfarm payroll jobs. Construction and manufacturing added 36,000 and 15,000 jobs, respectively, in January. The goods-producing sector of the economy added 57,000 jobs, while services sector added 139,000 jobs— education and health services led the way, adding 38,000 jobs, while leisure and hospitality came in second, adding 35,000 jobs. The 15,400 jobs added in retail—a reversal from those jobs declining by 25,600 in December—indicates serviceable demand for retail goods and services. With low unemployment and wage improvement, we can expect consumers to be more engaged in the future. Additionally, consumer confidence was up in January according to the Conference Board, another signal that consumer prospects remain bright. Taken together, the positive January jobs numbers for both goods and services sectors are good news for the plastics industry. 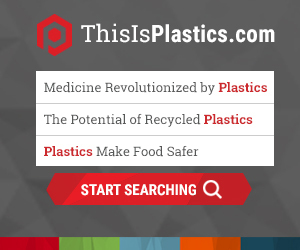 Plastics and plastics products are widely used in goods and services in the U.S. economy. A higher employment rate generates income, which supports higher consumption, and thereby stands to benefit the plastics industry. The fundamentals of the U.S. economy are expected to remain sound through 2018. Upbeat business activities in construction and manufacturing, including in health services and retail, should continue to buoy growth in the plastics industry.